Will you be at the next Catfish Club Luncheon? The success of our K-12 students requires all of us to work together. and others as we discuss the status of our schools. Please join us as we learn about the Community Choice Aggregation Program. City of San Diego Community Choice Aggregation Program Draft Feasibility Study. City of San Diego decides to secure alternative energy supply contracts for the community. and a representative from Clean Tech. Our moderator is Gene Cubbison, Political Reporter, NBC 7/39 News. Lunch is $20.00 and Seniors/Students are $10.00. USD in the Kroc Institute of Peace and Justice Building. We have planned an exciting program - free to the public. "Protect the Nation from Foreign Terrorist Entry into the United States". Executive Order on March 6, 2017 (scheduled to take effect on March 16). and removes Iraq from the list among other things. travel ban(s) and what we may expect in the near future. Our Moderator is Attorney Daniel Eaton, Employment Attorney, from Seltzer, Caplan, McMahon & Vitek. He will be joined by David Loy, Legal Director for the ACLU of San Diego and Imperial Counties. We are less than three weeks away from an election that a history making election season. in what we are calling an Election Forecast. criminal sentencing, new regulations for firearm and ammunition sales? Join the discussion on what is one of the most unique election seasons in recent history. subsidize a NFL franchise worth more than $2 billion? who has been working on behalf of a downtown stadium site. Bayview Baptist Church, 6134 Benson Avenue, San Diego, CA 92114. Lunch is $20.00 and $10.00 for students (cash or check). candidates forum to provide voters an opportunity to hear candidates discuss the issues. make every effort to engage in respectful dialogue regardless of the topic. 5th Annual Restoring Respect Civility Conference. It will be held on Monday, April 18 from 8:00 AM- 12:00 Noon. We have an exciting and timely program, which is free to the public. Please make it a point to attend this very important conference and feel free to bring a friend. 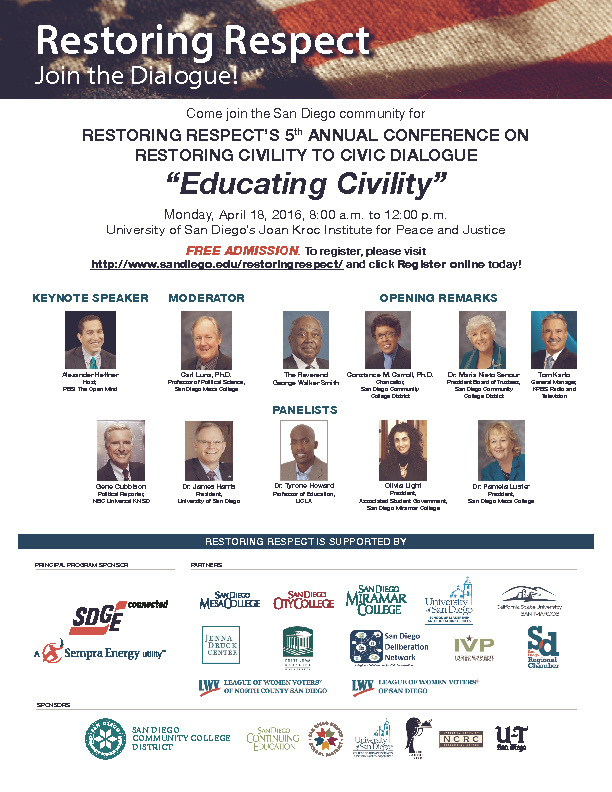 "Restoring Respect is community initiative promoting greater civility in San Diego civic dialogue. the University of San Diego."